Edible Squid Postcards And The Story Of Susami | OhGizmo! By David Ponce on 12/01/06 • Leave a comment! Produced by the Susami fishing cooperative, Surumail postcards consist of dried surume squid (Todarodes pacificus), the local seafood specialty. 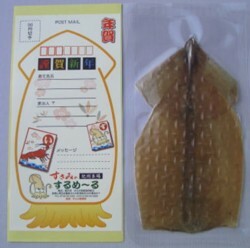 The squid jerky is flattened and vacuum-packed into the shape of a postcard, and an adhesive label is included for the postage, delivery address and a short message. What’s more interesting is that ever since they went on sale in 2,000, the cooperative claim they’ve sold between 4,000 and 5,000 such cards, which go for 320 yen (under $3) each. Now, you might be wondering why anyone would ever buy such a thing. It turns out that the town of Susami has a sort of love affair with the sea. For the details, read the full article. Susami is not a town like any other. They loves the sea. Hell, no, they are in love with the sea. 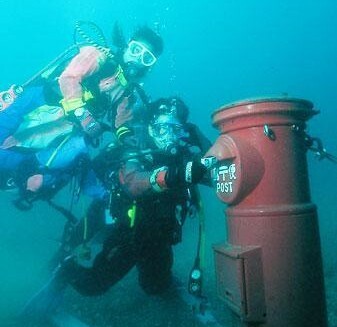 So much so, in fact, that they’ve installed an underwater mailbox. Not a decorative mailbox, mind you, or a sunken relic; it’s a working mailbox to which real mail is delivered, and in which up to 200 messages accumulate during busy times. It’s not clear how the messages are kept dry, nor what sort of toxin has infested the town’s drinking water to drive them to such psychotic sea-lovin’, but this sort of puts the edible squid postcards in perspective.